At Beta Klinik we employ a digital X-ray device. With this hardware, conventional X-ray films as well as digital data sets can be created. The advantage of digital X-raying is that images are converted into digital data sets that can be put on a CD or DVD. Sending them via internet is also possible within shortest time. A person´s images taken only a few minutes ago can be sent to any country of the world to a physician that provides further treatment to the person. This physician is then able to evaluate the pictures comfortably within a few mouse clicks. 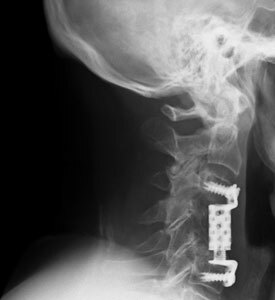 The image on the left is an image detail of an x-ray image taken after cervical spine surgery. After surgery it was important to control the proper position of the vertebral body replacement. During an X-ray examination, X-rays penetrate the body and react with a medium behind it. In case of conventional X-raying, this medium is an X-ray film. In case of digital X-raying, it is a digital receiver creating digital data sets. X-ray examinations can be done within a very short time and help developing diagnoses, for example, about bones, joints or organs.